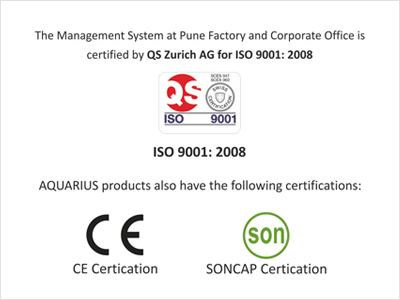 State-of-art factory at Ambadwet, Pune having Quality Certifications like ISO 9001, CE, etc. Paint Sludge Removal, Coolant & Oil Cleaning, Solid-Liquid Separations, Water & Waste Water Treatment, Phosphate Sludge Removal, Solvent Recovery are some of the major applications provided amongst others. Aquarius Engineering Consultancy Pvt. Ltd. (AECPL), a part of the AQUARIUS GROUP, was started as Aquarius Engineers in 1981 as an industrial consultancy organization. Adding further, Aquarius provides Centrifuge Separators, Hydrofloty Systems, Chemicals and Solvent Recovery Systems for applications like Paint & Phosphate Sludge Removal, Coolant & Oil Cleaning, Solid-Liquid Separations, Sludge Dewatering, Water & Waste Water Treatment, Solvent Recovery, etc. Today, it has a wide range of clients ranging from small companies to large multinationals and covering various industries such as Automobiles, Auto Parts, Forging, Engineering, Chemicals, White Goods, etc. Understanding of updated industry-specific requirements, proactive design considering latest technology and a turnkey approach has helped AECPL chalk many a success stories in the market like Mahindra & Mahindra, Bajaj Auto, Volkswagen India, Daimler India, Varroc Polymers, Polyplastics, Bharat Forge, TATA Cummins, Kansai Nerolac, Kalyani, Bonfiglioli and many more. Aquarius takes pride in its state-of-art factory based at Ambadwet, near Pune. High Quality, Safety & Environment standards are maintained during the manufacturing process viz. ISO 9001, SONCAP, etc. Today, AECPL is widely recognized as a knowledge based company providing apt technology solutions in the Centrifuge Separation and Surface Coating field. The infrastructure consists of a team of young, creative and dynamic professionals, backed by major expertise in related niche areas. Our expertise covers all the aspects of cleaning of industrial fluids with Centrifugal Technology and Surface Coating Technology. Aquarius Engineering Consultancy believes in a shirtsleeve approach, working closely with customer's personnel. It has led to a better understanding of the facts and the most apt application of the data and technology. Aquarius has well-trained and experienced technologists and experts in the relative application areas. With application knowledge and thorough system design we are integrating our solutions successfully into our customer’s processes. We have professionals with over 20 years of experience in the Fluid Dynamics, Design and Automation field. Expert members are trained with local and global leaders in specific industry like Century South Korea, STA, HYDRO ITALIA, etc. We have a tie-up with STA Separatoren-Technik & Anlagenbau GmbH, Germany for their Centrifuge Sludge Separators. We also have a collaboration with HYDRO ITALIA SRL, Italy for their wide range of Water & Waste Water Treatment Chemicals and Sludge Separation Systems.